American general warns that ISIS fighters may have seized air-defense weapons when they recaptured ancient Syrian city. Islamic State (ISIS) fighters may have seized air-defense weapons when they recaptured the ancient Syrian city of Palmyra, a U.S. general warned on Wednesday, according to AFP. Lieutenant General Stephen Townsend, who commands the American-led coalition bombing ISIS in Iraq and Syria, said jihadists seized a trove of gear when they retook the desert city from Russia-backed Syrian regime troops on Sunday. "We believe that includes some armored vehicles and various guns and other heavy weapons, possibly some air-defense equipment," Townsend said in a video briefing from Baghdad and quoted by AFP. "Basically, anything they (ISIS) seize poses a threat to the coalition, but we can manage those threats and we will," Townsend added. "I anticipate that we'll have opportunities to strike that equipment and kill the ISIL that's operating it soon," he said, using an alternative acronym for ISIS. Townsend did not describe whether the air-defense weapons were anti-aircraft guns or missiles. ISIS jihadists recaptured Palmyra on Sunday, after temporarily being stopped by Russian forces. 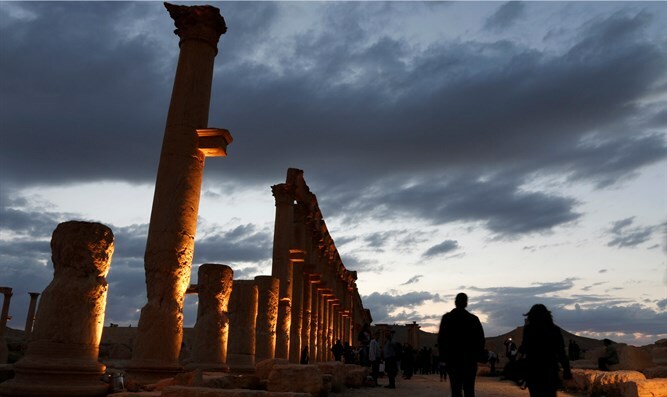 ISIS overran Palmyra, known as the "Pearl of the Desert", in May of 2015 and proceeded to blow up UNESCO-listed temples and looted relics that dated back thousands of years. The jihadist group used Palmyra's grand amphitheater for a massacre in which child members of the group killed 25 Syrian soldiers, execution-style, in front of residents. It also beheaded Palmyra's 82-year-old former antiquities director last August. Townsend said on Wednesday the coalition would, at least initially, defer to the Russians to try to retake Palmyra. "If they don't, we will do what we need to do to defend ourselves and we'll de-conflict those actions with the Russians," he added. The Pentagon and coalition partners have accused Moscow and Damascus of taking their eyes off Palmyra to focus on bombing the former rebel bastion of Aleppo. The U.S.-led coalition, which is narrowly focused on fighting ISIS, has not had an active role in Aleppo, and Townsend said the regime's recapture of the city would have only a "relatively moderate" effect on coalition actions in Syria. "Because I think the regime and the opposition forces that are fighting their war adjacent to ours will take their fight elsewhere," he said without giving details.